I'm really trying to keep up my #OnWednesdayWeWearArt posts! I know I missed last week, but if I can get at least a couple in per month, that's good, right? This week's artist is Space Invader, a contemporary street artist who creates pixelated retro video game images in public spaces using tiles. I love retro video games! When I was teaching art, I had several projects inspired by retro video games/pixelated artwork. Now that I'm teaching computers, it's the perfect marriage of the two subjects. This skirt has quite a story to go along with it. 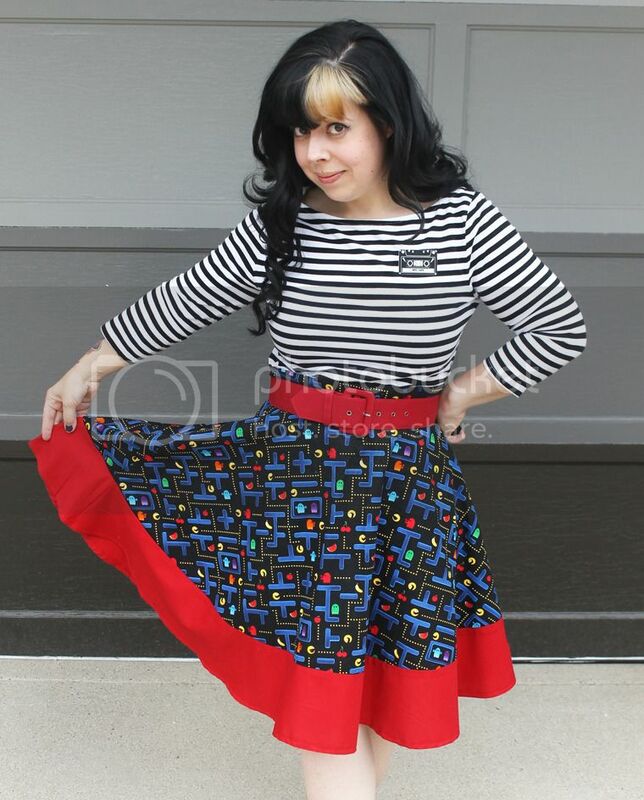 I bought this pac-man skirt on Modcloth (it's called the "Playful Feeling" skirt), and I was surprised to find that it was too big. So I sent it back for a smaller size, and crossed my fingers that it wouldn't sell out of the size that I needed while waiting for my exchange to take place (this is pretty common with certain items on Modcloth, so I've found that it's usually best to place a new order, and to return the other item for a refund... but I was feeling lucky). The exchange went through smoothly, and I wore the skirt once. Then I washed it. I swear it got way shorter, and I'm only 5'1"! ...but I love this Pac-Man print, so I decided it was worth a sewing attempt to add a red "border" in cotton, since the rest of the skirt is cotton. How hard could it be, right? One trip to Joann's and about an hour and a half later, and this was the result! It isn't perfect, but it's passable, and I love it! The red fabric on the border matched the red belt I snagged at Savers for $1.99. My favorite new thrift store items are wide belts in various colors, and a rainbow of cardigans (I'm currently only missing orange and charcoal gray!) for between five and ten dollars each! Oh, so back to Space Invader. That's the name he goes by. His identity is a secret, kind of like Banksy. You can follow him on Instagram to see his latest pieces! He creates a whole range of retro/pixelated video game-esque images. I love how even though on one hand, his work is a form of "vandalism," it's not exactly the kind that you'd mind because it's happy and cheerful and in many ways makes the buildings and structures that he adheres his tiles to look even better...! 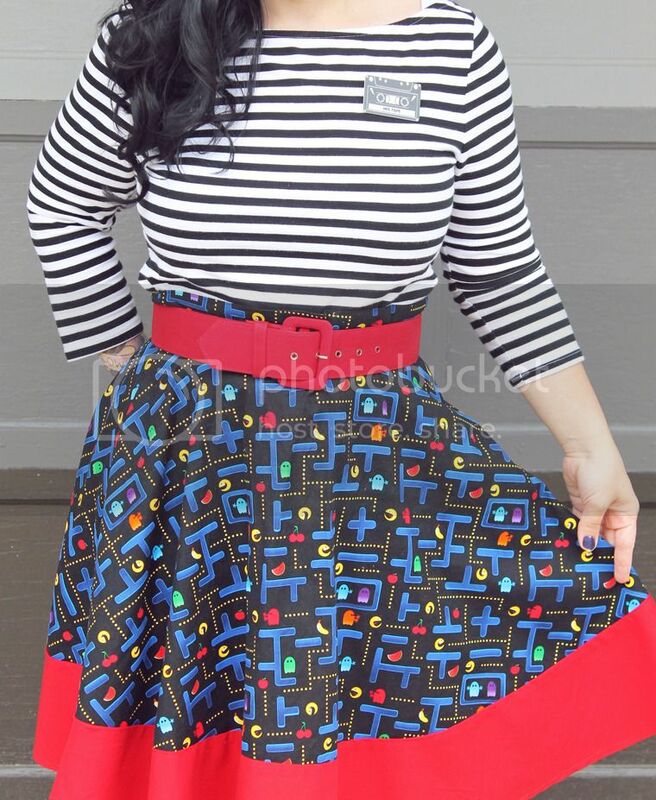 I saw a dress on instagram from Silly Old Sea Dog that was made of this Pac Man fabric, and I fell in love... until I saw the price, plus international shipping. Wahhhhhh. 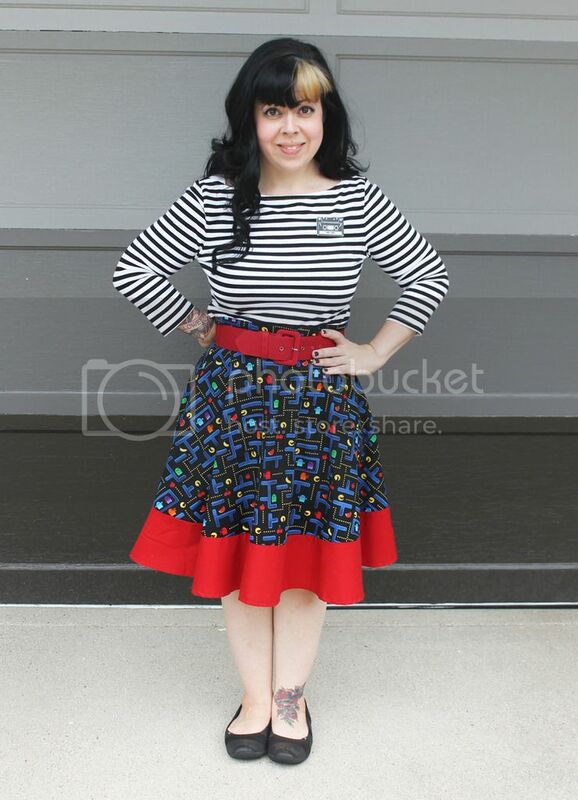 So I did what every obsessive online shopper girl does, and Googled "pac man dress" until I came across the Modcloth skirt. I thought that it was a good consolation prize. 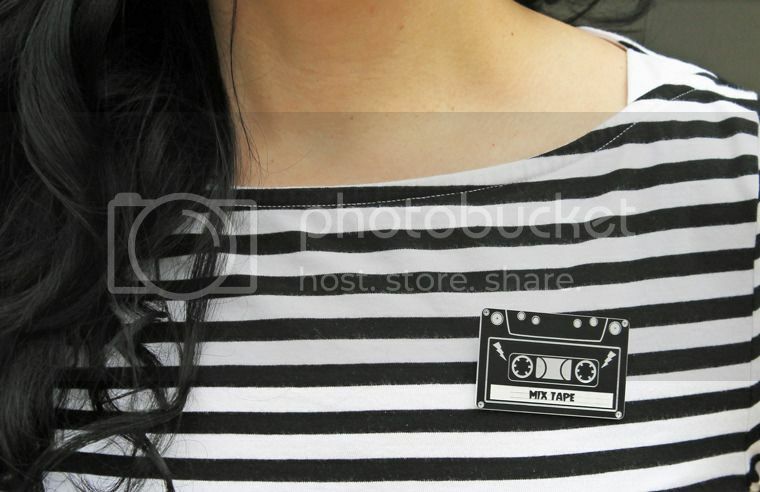 Today I wore my mix tape brooch from Heidi and Gretel! I originally had Ms. Pac Man dangle earrings on instead of a brooch, but it just felt like too much. So a simple black and white brooch on a black and white shirt was just the thing. 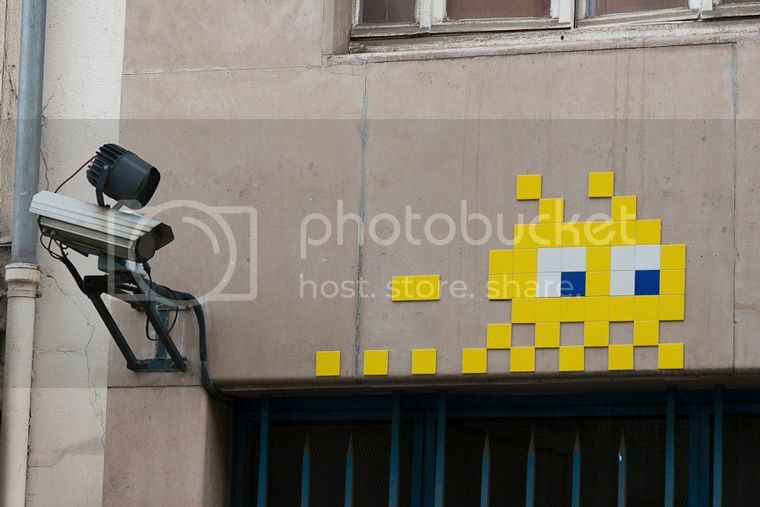 Because Space Invader's work is becoming more well-known and popular, sometimes his work is taken down by others in an attempt to sell for profit. It does not always survive the attempt to be removed in the process, which is kind of sad. I like to think that this kind of artwork is for everyone, and not to be sold into a private collection. I'd be pretty darn excited if one of these pieces randomly showed up on the side of my house. I definitely wouldn't try to take it down! This boatneck shirt from Target is my favorite thing. In fact, I ordered two more in black, one in purple, and one more in black with white stripes (the black stripes are wider than the white... looks different from this one). You can't go wrong with the price, especially compared to $48 via Pinup Girl? I mean, I love me some P.U.G. don't get me wrong, but I've gotta save a few cents somewhere. Now that I've "mastered" lengthening my skirts, I think I might have enough confidence to tackle a bigger project, like a circle skirt! I have some awesome black Halloween fabric that would be perfect for one!